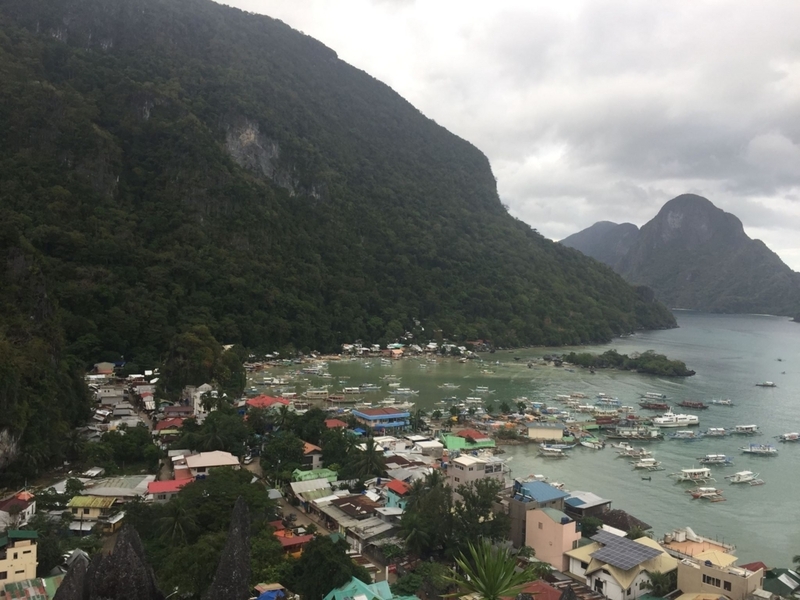 I summarized the troubles caused by a typhoon in El Nido in the previous article. 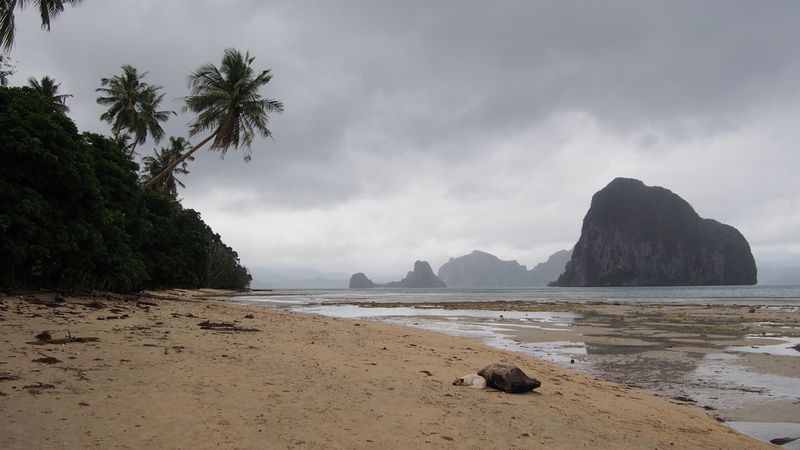 I am going to write about places I went and activities I did in El Nido when it was not rainy. 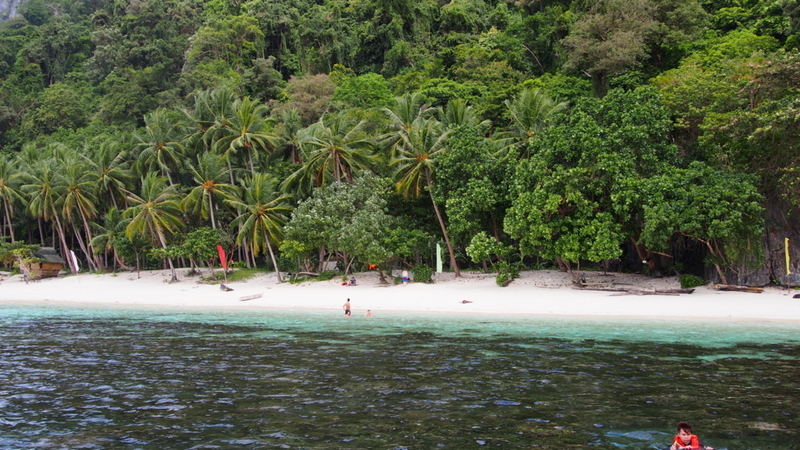 Las Cabanas Beach is in the south which is a few minutes away from the center of El Nido. It took 12 minutes from the hotel we stayed in. You can get to the beach after going down this flight of stairs. The beach was messed up by a typhoon. The dog in the middle of this picture also looks disappointed. But if you see the ocean and the beach from the sky, you will find out how beautiful it is. 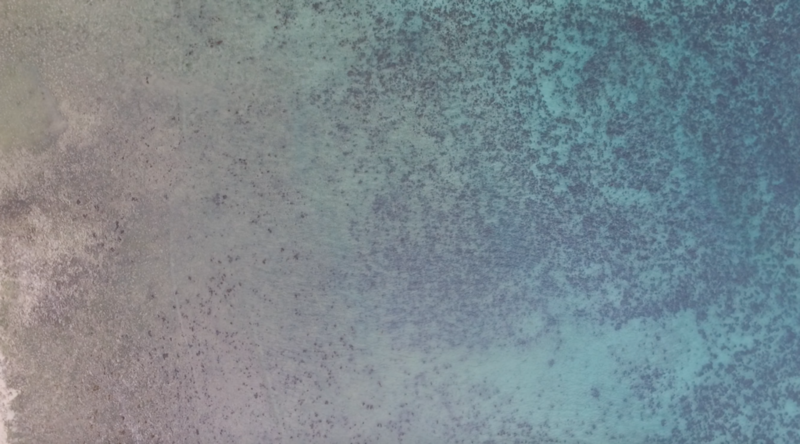 The ocean is so clear! If the sun is sunshining, the color looks even more beautiful. 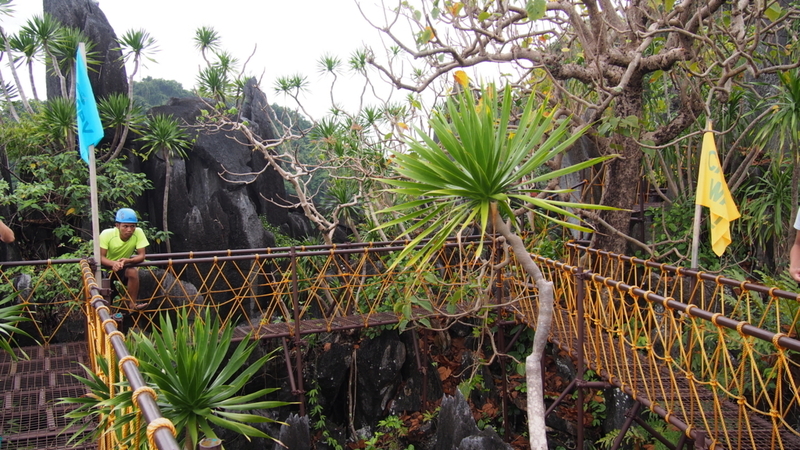 You can also enjoy ziplining here. If you want to do something but you don’t have enough time to go to the places which are far away, Canopy walk would be great. 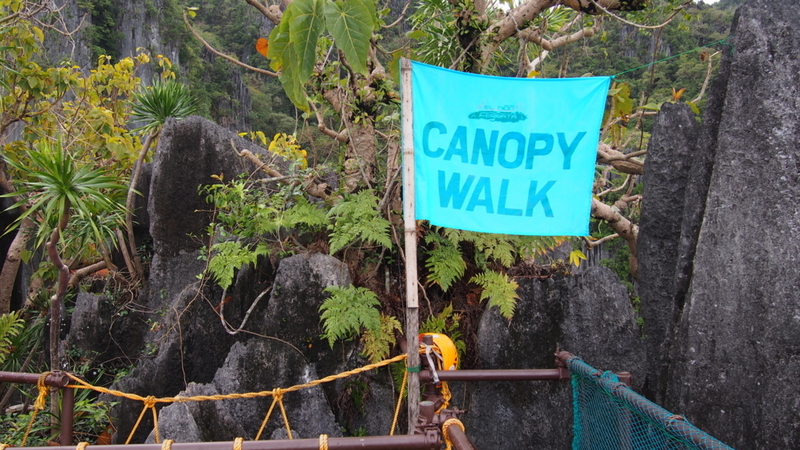 The location of the canopy walk shop is in the center of El Nido but it seems to hide. It is only one minute away from the hotel but we couldn’t find it. (Mabye because it was too close?) We asked local people where the place is and found it. 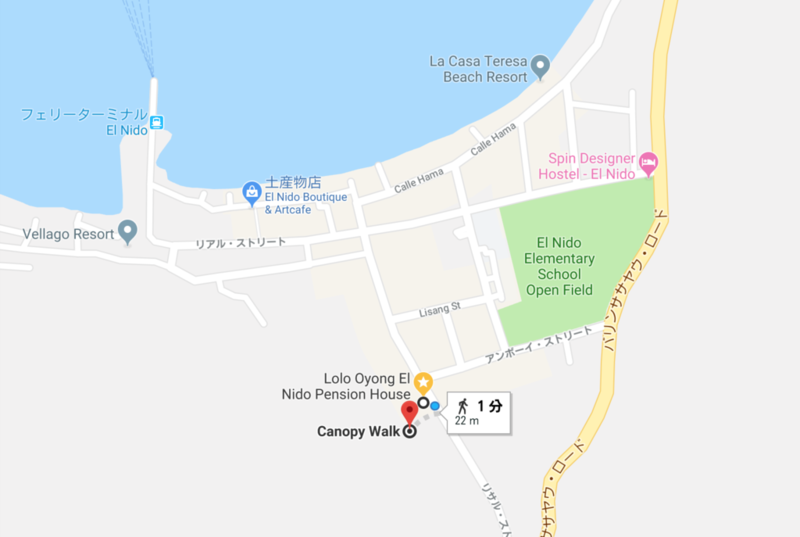 You can get there by passing through one narrow street from the main street. This is the starting point. You will rent a rope with a carabiner and a buckle which saves your life and a helmet. 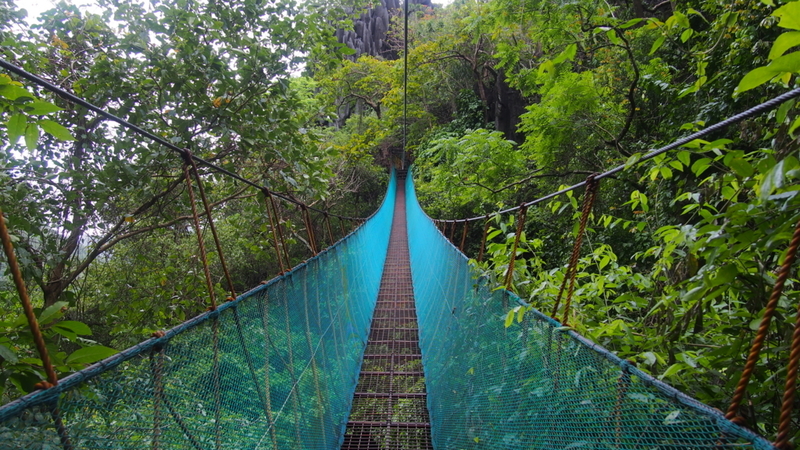 Canopy walk costs 500 pesos for each person. It is about 10 US dollars (5th/Sep/2018). You definitely need an insect repellent spray. A guide will navigate you so you can just follow the guide. There is a suspension bridge on the way. 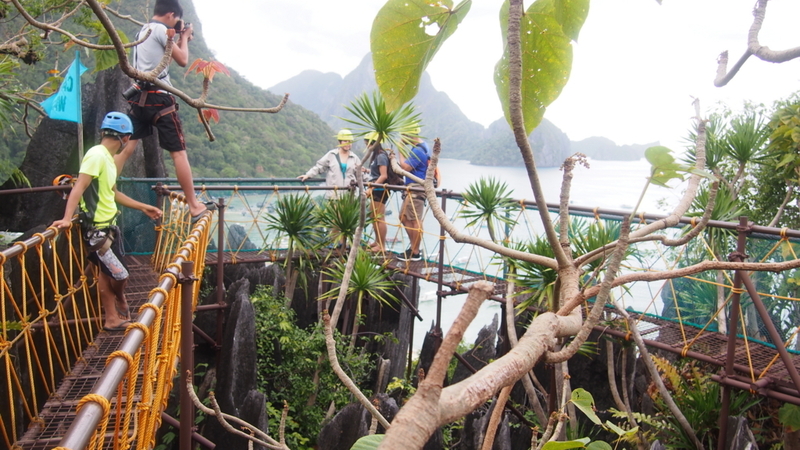 You can walk around at the top and see the whole of El Nido town. The view is good! 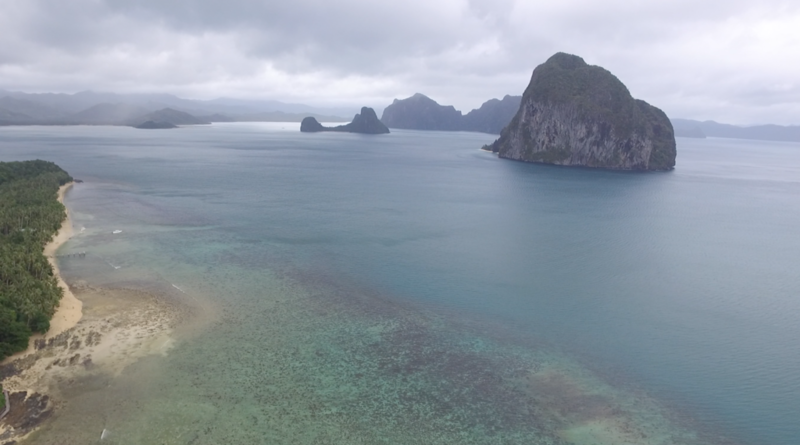 You can see the view of El Nido town. The weather is not good. The staff will take your pictures. Those poles seem to be just put on the stones and not fixed. So it looked a little bit dangerous. But the shop is in the center and it doesn’t take a long time. And the view from the top is really awesome, I can recommend going! It was canceled once due to a typhoon but I definitely recommend to join an Island Hopping tour. It is totally worth it! 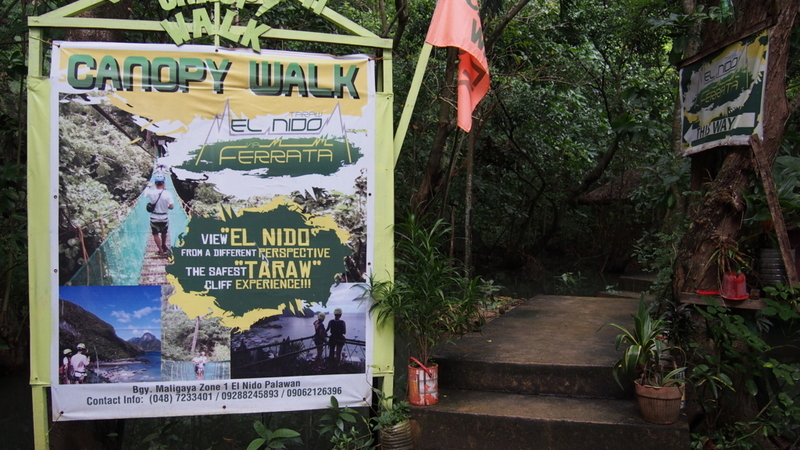 There are 4 basic tours in El Nido tour. And there are 4 choices from A to D.
Each tour goes to 5 different islands but the islands to visit are different for each tour. If you choose a Combo tour, you can go to 7 out of 10 different islands. We have chosen Combo Tour A&C. The cost of each combo tour is as follows. This exchange rate is as of the on 9th of September in 2018. I guess the reason Combo A&C is the most expensive is that it is the most popular. 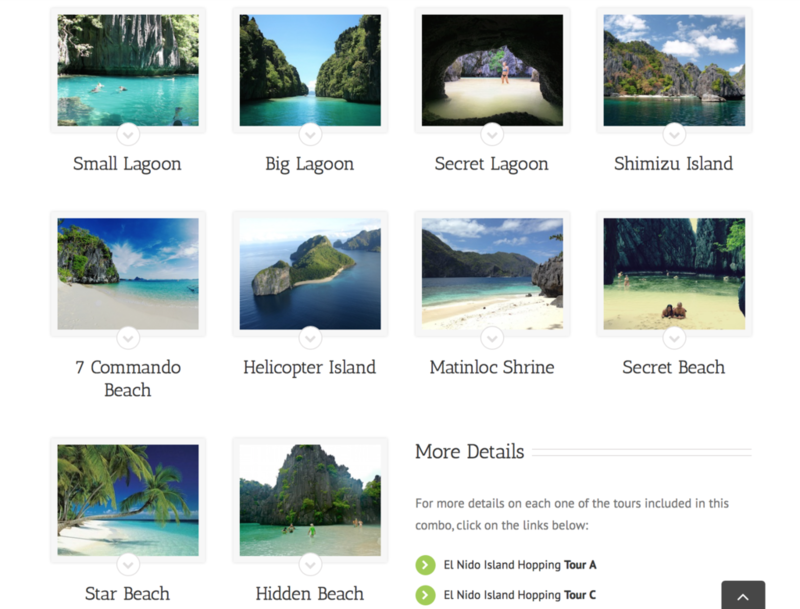 These are the islands to go on Combo A&C tour. 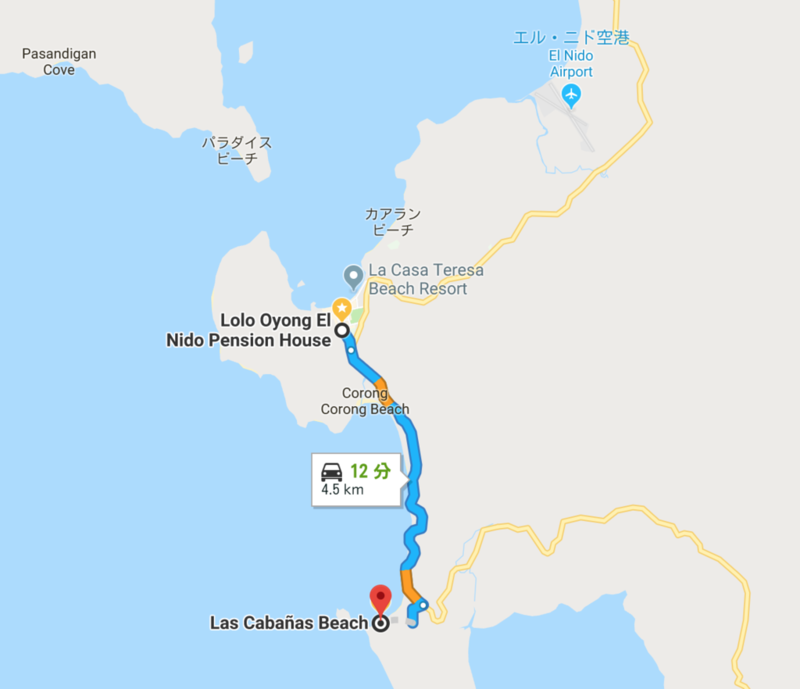 We actually went to 1: Papaya Beach（It is not in the HP）→ 2: Helicopter Island → 3: Talisay Beach（It is not in the HP）→ 4: Hidden Beach → 5: Secret Beach → 6: Big Lagoon → 7: Small Lagoon. 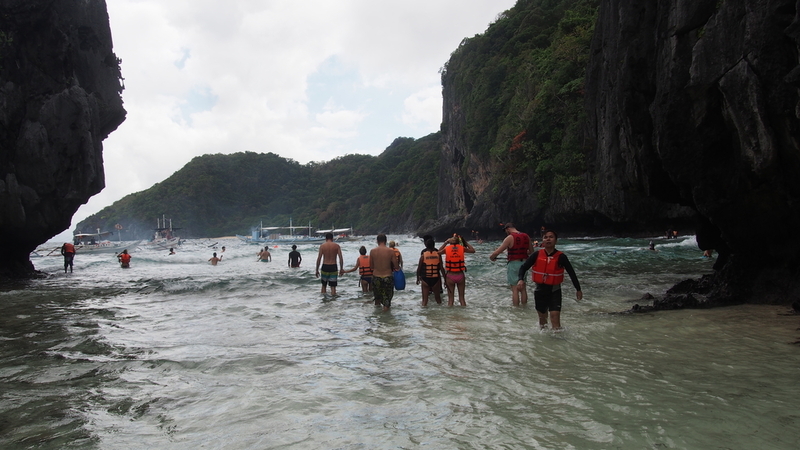 During the tour, the tour guide sometimes changes the destination if the island we are supposed to go is crowded. The islands I wrote “It is not in HP” are those islands which are not in the original plan. On the tour day, the tour staff tried to accommodate as many custmers as they can since it was right after a typhoon and their business got affected negatively. Tourisits who came earlier just waited for a long time. The tour guide changed the destination to Papaya Beach. We stayed here for only a short time. It was about 10 to 20minutes. We enjoyed just swimming or snorkeling. The next island we visited was Helicopter Island. The name came from the shape of the island. It looks like a helicopter, right? The water is so so clear and beautiful! Since the people were not able to swim for the past days due to the tyhpoon, they were really enjoying swimming and taking photos at the beach. The boat stopped a little bit away from the beach the beach so people have to swim to get to the beach. It was still windy and the waves were pretty high on that day so it was hard to swim. If you walk for a while, there is an open space and you come from the left side to the beach in the picture below. You have to swim again to get to the beach. And the distance is farther when compered to Hidden Beach. There was no beach looking around the boat. The entrance of the Secret Beach is very small and people usually can’t find it. You have to swim at least 20 meters to get there. There is a small limestone tunnel that you have to pass through. The Secret Beach is in the inner part of the limestones. This is how the inside is (the entrance is under the limestone which is in the center of the photo but probably you can’t see it). 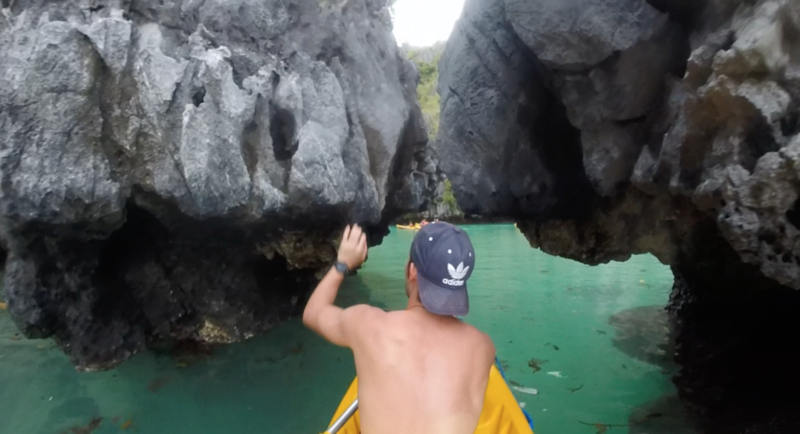 Secret Beach is completely surrounded by limestones. It was like only a few people knew its location and kept it a secret within themselves. As the suggested by its name, this is exactly a secret beach. 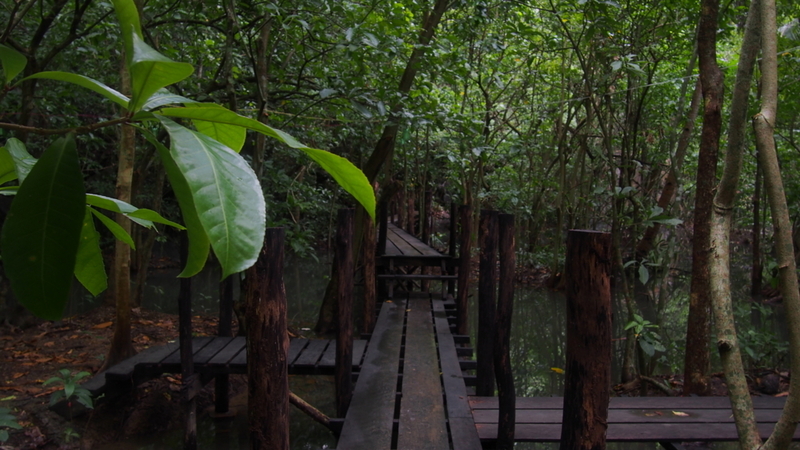 You can also enjoy lagoons on the latter half of the tour. Big Lagoon was so magnificent. Big Lagoon is so popular and there were many staying boats, so the entrance of the lagoon was crowded. You can enjoy kayaking here. Some points are shallow enough to walk but many big boats also pass even though it is so shallow. There is another lagoon called small lagoon. The entrance is small like the one of the secret beach. 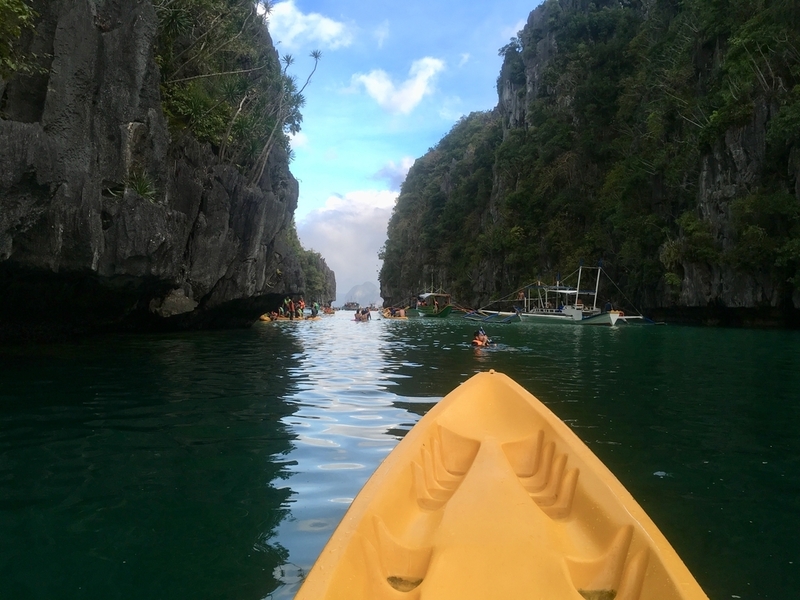 You can enjoy kayaking here as well. It was pretty late and it was getting dark. We stayed on the kayak and enjoyed the quiet and peaceful moment. 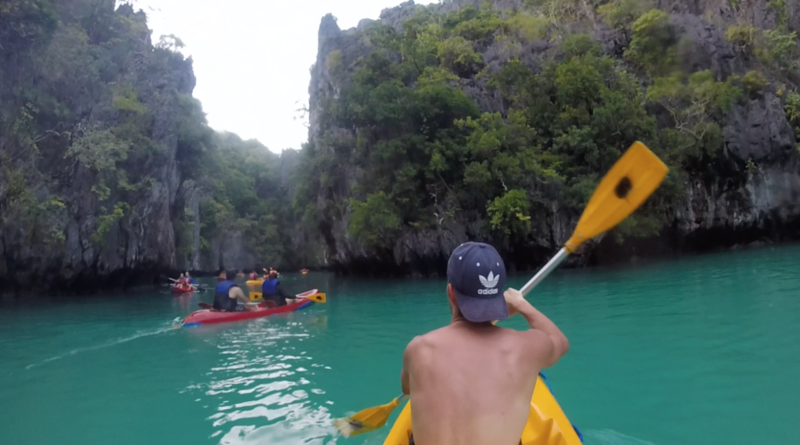 I really felt like I am part of nature and I wanted to stay a night on the kayak. 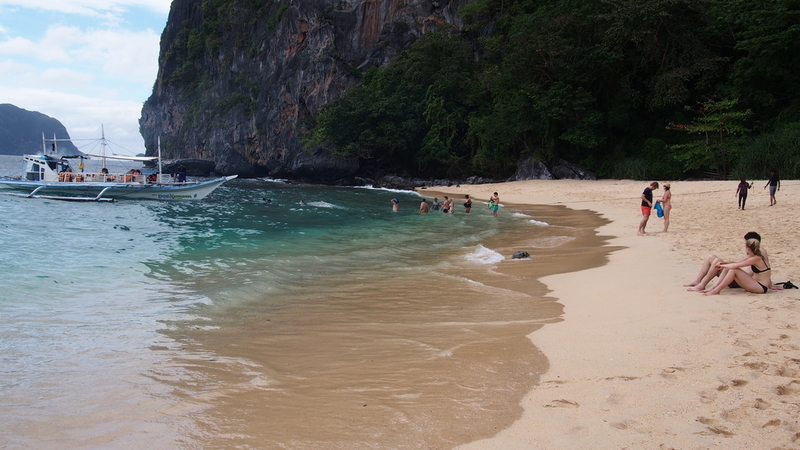 You can not enjoy without this Island Hopping Tour, haha. I really enjoyed and I want to recommend you to join this tour. You can check the detail on this HP. 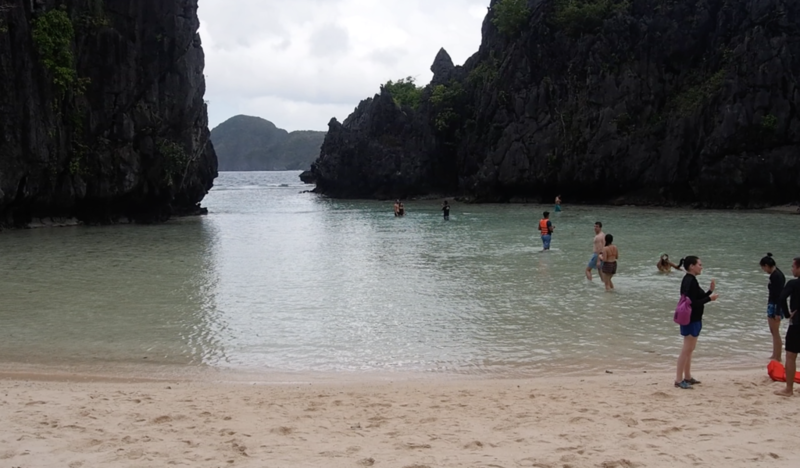 Typhoon ruined our time in El Nido but we still enjoyed enough. There are so many beautiful places that attract many people. 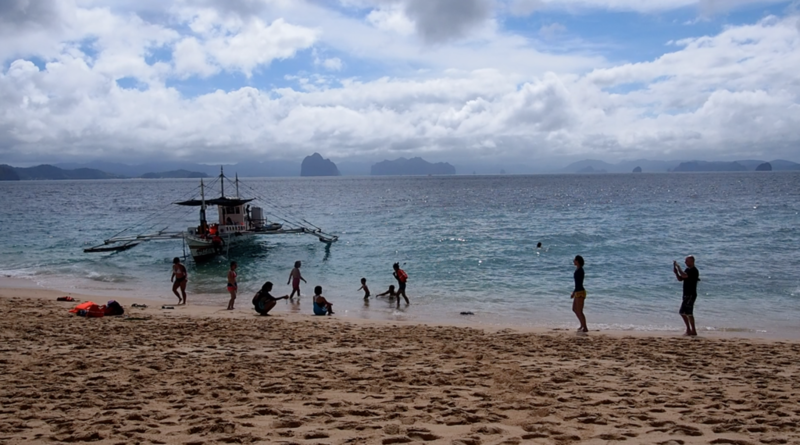 Love traveling: Troubles in El Nido, There is a probability that your carefully crafted plans will be ruined in a tropical paradise. 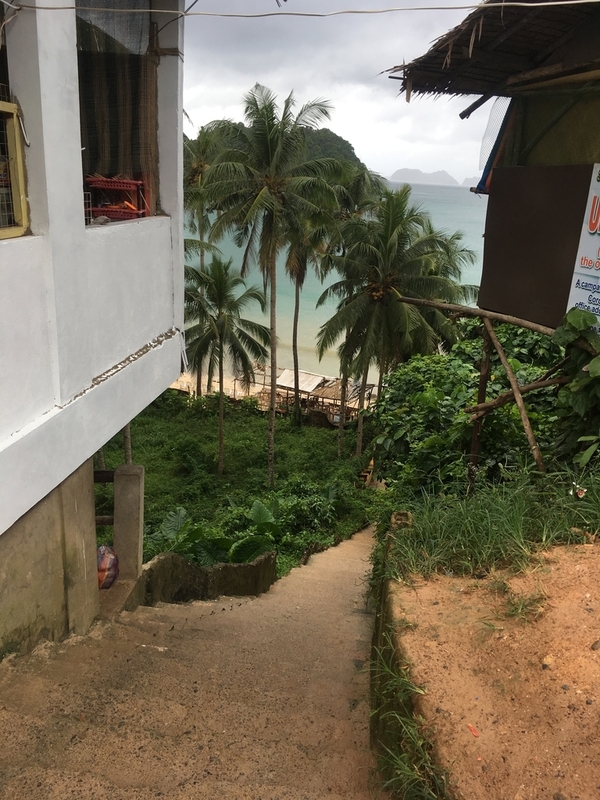 I am writing about El Nido but I think some of you already realized this is not going to be a positive article. 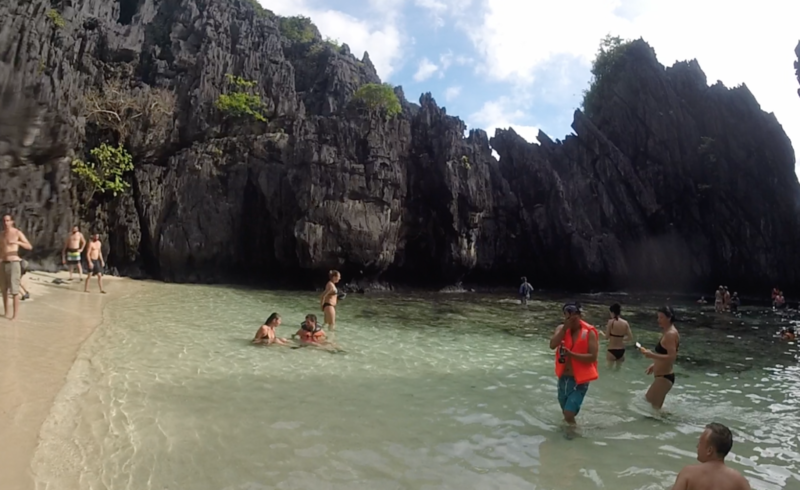 I want to share the troubles I had in El Nido with you. I was supposed to stay in El Nido from the 1st of January until the 4th of January. 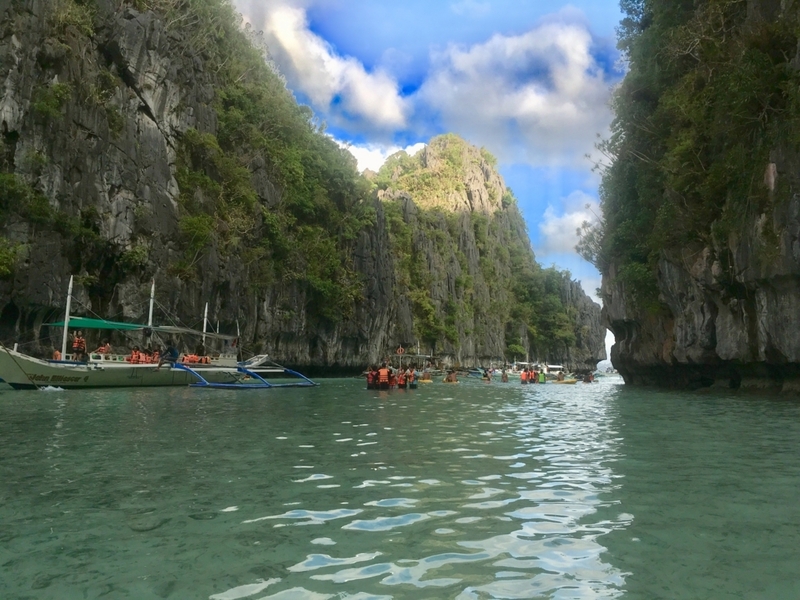 El Nido is said to be the most beautiful place in the Philippines and I was really excited to explore and join each tour we booked in advance there. But UNFORTUNATELY, the first typhoon in 2018 came and hit Palawan and messed up my plans. 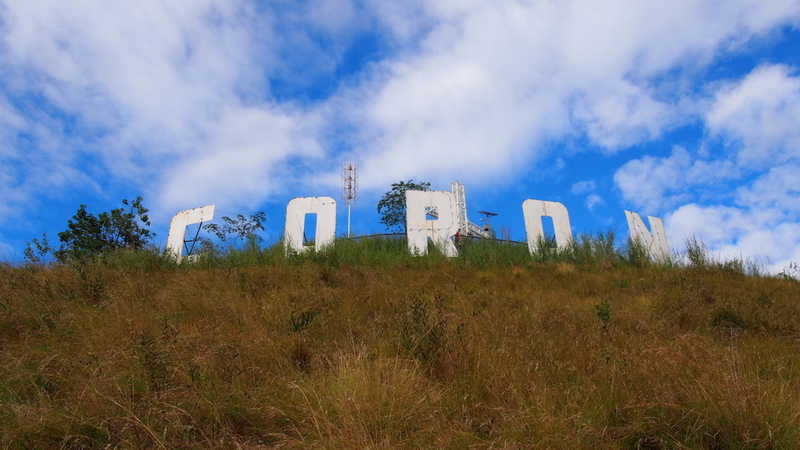 The two tours were canceled and my friends and I were about to miss the ferry to go to Coron. 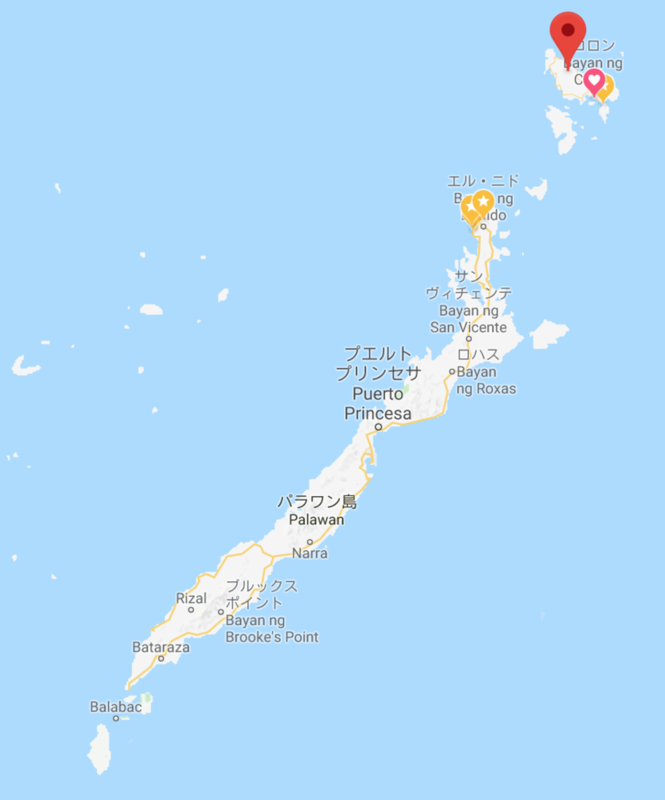 I am going to write about those troubles in order, but what I want to tell you is if you travel in a tropical country, you should think about what to do when a typhoon comes. The country you travel might not manage customers in the same way your country does. 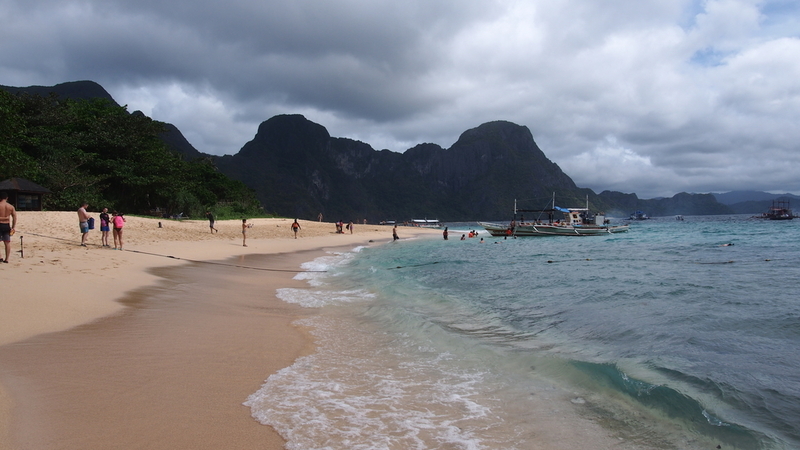 The location of El Nido is in the northern part of Palawan. 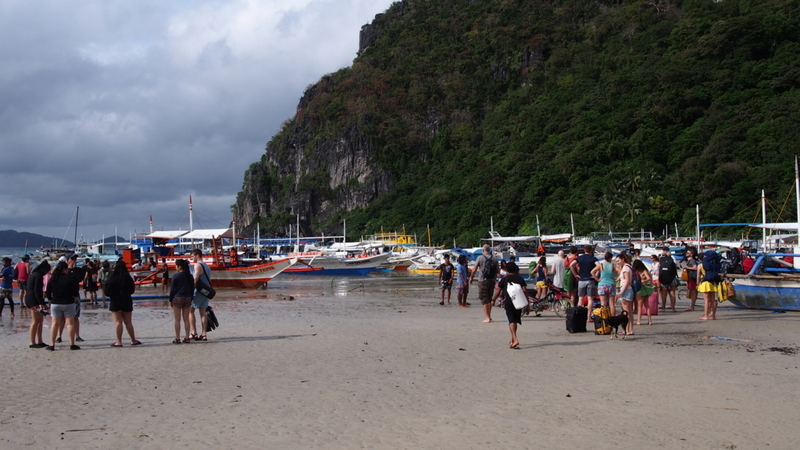 You can take a tricycle from El Nido airport and it takes about several munites to get to the main town. The population is about 40,000 and restaurants and many shops for tourists stand in a line. I saw more tourists, expecially from Western countries, than the local Filipino people. And I heard British accent more often. 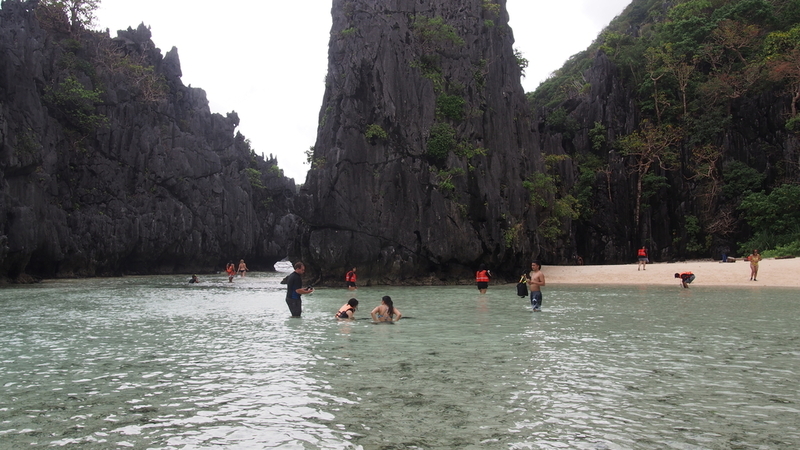 El Nido is also a port island to go to small islands in the north in Palawan. There are many boats staying here. 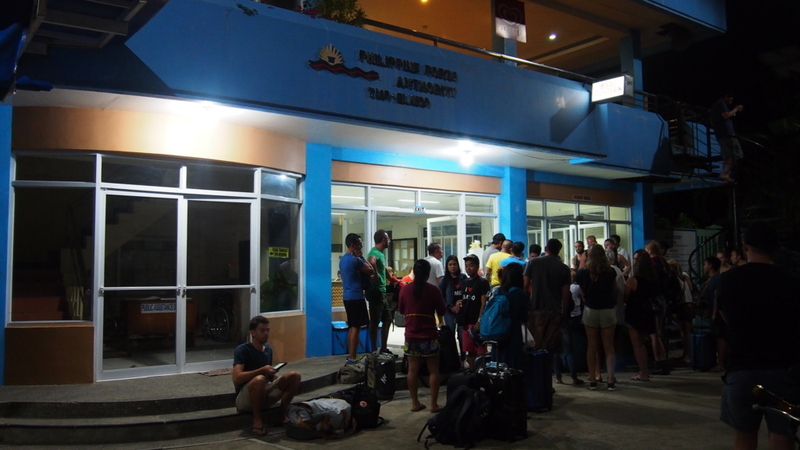 The day I arrived in El Nido, my Filipino friend and I checked-in our hotel first and met another Filipino friend. It had been a long time since we gathered last. We had a dinner and enjoyed drinking beer next to the beautiful beach. We were thinking about only fun things. I was supposed to dive the next day. Our travel plans were ruined by the first typhoon in 2018 whose name is Agaton. It hit the middle of Palawan from on the 2nd of january until the 3rd. This is the typhoon information from the Meteorological Agency in Japan. I realized that it became a typhoon on the 31th of December. But who cares about a typhoon during a trip? I didn’t think about a typhoon at all because it had been totally fine after I arrived in the Philippines. The central pressure was over 1000hpa, which means it is not a so strong typhoon. But people were not allowed to take boats from the ports due to the wind and rain. We could not do anything so we stayed at the hotel for a long time. But we didn’t want to waste time so we decided to go to Nacpan Beach even it rained. We road a tricycle to Nacpan Beach on the messed road for about 50 minutes by a tricycle. I just wished it was sunny. I can not tell you how tall the wave actually is. It is pretty tall. People evacuated under the beach parasoles when it got heavy. Some people still enjoyed playing volleyball. We had a lunch under a parasol. The steamed crabs we had at lunch was so good. The broadcast said that the typhoon would pass Palawan on the 3rd of January, so we thought it would get better soon. 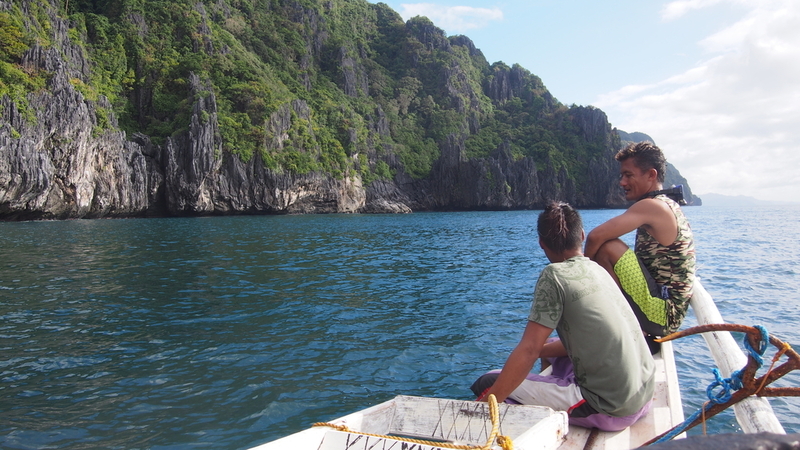 We were supposed to join the Island hopping tour on the 3rd of January and it was the tour I really looked forward to. We booked a private Combo Tour A & C so we could enjoy the boat by ourselves. You can check what the Combo tour A & B is from this site. We went to the shop to check the situation of the tour and if we could go on the next day. All tours from the 2nd of January were cancelled. The staff said that the typhoon had already passed so we could probably go on the tour. But the coast gaurds will give the final decision on whether or not to allow tours by 5am on the next day. So the tour agency could not say anything yet. We went to drink with unsure feeling. It was cloudy but it wasn’t so rainy. I expected we probably could go!! ■ It was not enough to allow tour even if the typhoon completely passed!? My friend got a message from the shop which said all tours for the day have been canceled as advised by the Philippine Coast Guards. My friend asked why since it wasn’t so rainy, so why? And the answer was it was still windy offshore so the coast guards still warned about the risk. We all got disappointed but there was another thing to worry about. 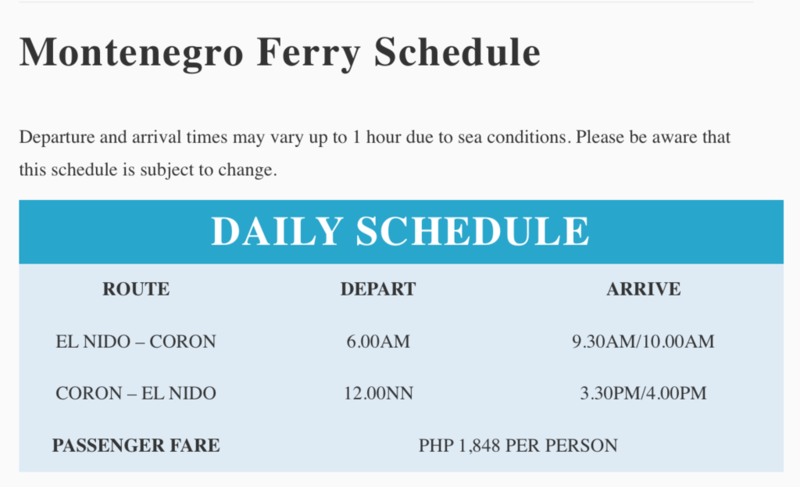 It was whether we can take a ferry to go to Coron on the 4th of January. We have to take a ferry to go there. If we missed the ferry, we have to book a new ticket. My friend went to check the condition of the booking. ■ A ferry ticket can be quashed when a typhoon comes!? Can you believe it? Even if you booked the ticket, it might be quashed for the people who missed the ferry before you. 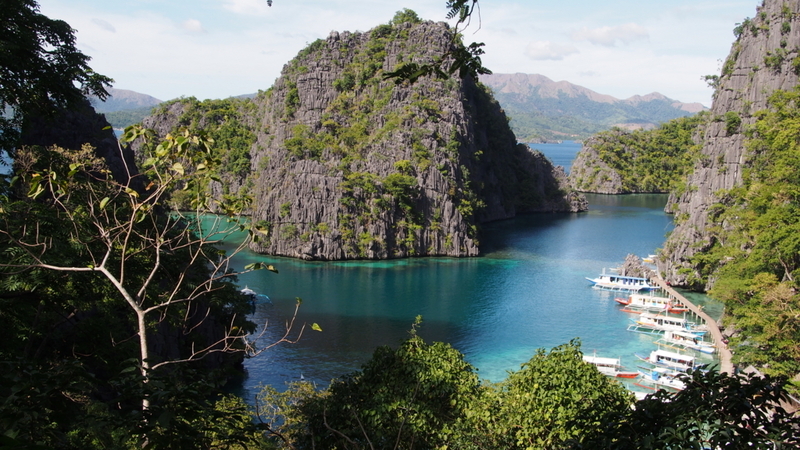 We realized that when we asked if we could go to Coron as scheduled. The ferry trip had been canceled for two days so many people missed their trips and those people were given priority to take the ferry even if we already booked. 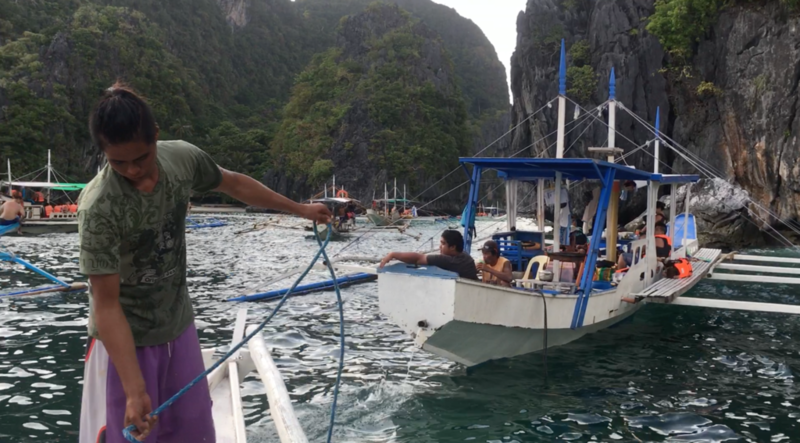 We booked a ferry ticket online a couple of months earlier through elnido.ph but when we talked to the staff of elnido.ph, they could not give us a ferry ticket because they said the ferry tickets are already sold out due to the canceled trips. They said we can reschedule the trip or they can give us a refund. We needed to book a new ticket for a ferry leaving on 5th. But it was really difficult to get that because there were many people who wanted a new ticket like us. Thanks to my friends’ tenacious negotiation we finally could get that. 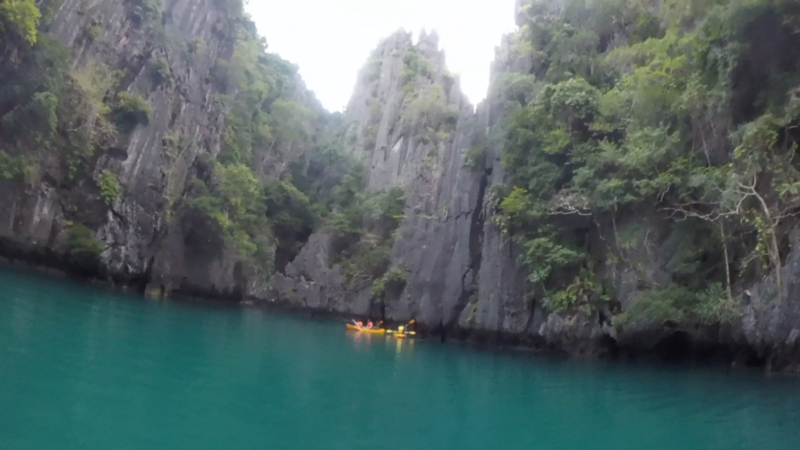 But going to Coron was postponed a day. Since the ferry was postponed we decided to join the private combo A & C tour for the next day. We were remaking the travel plan carefully step by step again and it seemed to be going well. And we realized we can go on a tour that day. When we got to the shop, there were many other tourists who found out the weather condition got better and expected they can join the tour without an advance booking. I thought we already booked so we all are fine. But my friend started to have a quarrel with the staff with an angered face and I realized something was going wrong. I asked him what happened and he said they said there is no private boat and we all are going to take the same boat with other people who are coming to the shop now. You know what? The tour shop thinks more of the number and not the booked customers. I understood it must have been a hard time for the shop to make money during the typhoon. But if they cancel the booking, it breaks the trust of costomers causes bad evaluations. We needed to join the public tour. It happened as if to add insult to injury. Although it was not the worst thing that happened on that day. An even worse thing happened during the tour. I flew my own drone at the small beach surrounded by limestones which are about 100 meters, I think. And it was blown away by the wind and it got stuck on the stones. I could not take it back. But the tour was really good. 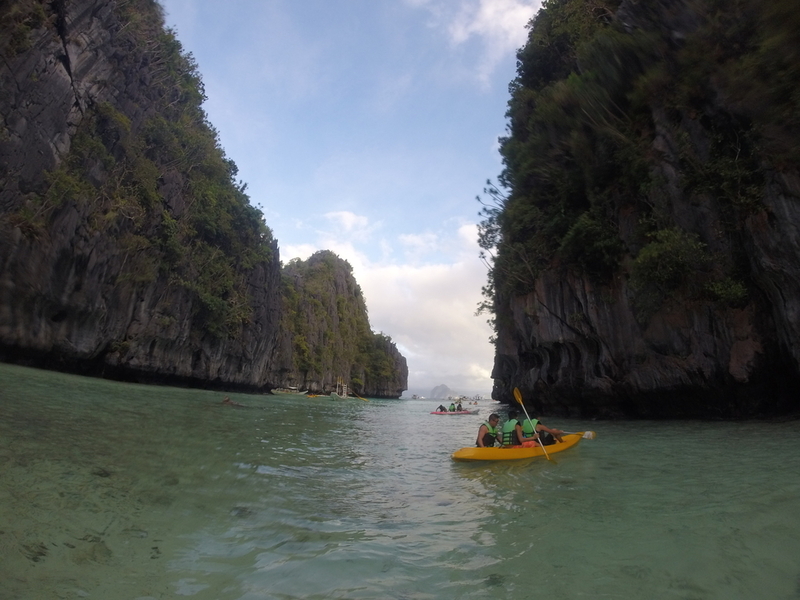 They brought us to some islands and we enjoyed swimming, snorkeling and kayaking. The lagoon was especially beautiful and it was my most favorite place for me on the tour. I would like to write about the tour in another article. 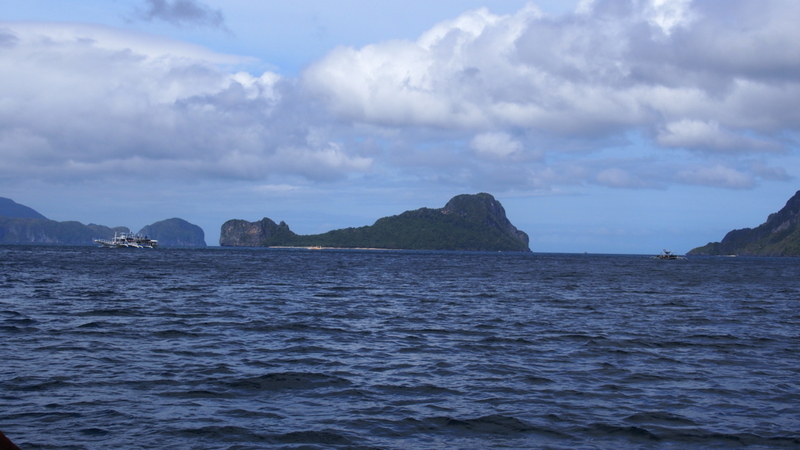 We went to the port in the really early in the morning on the day we were scheduled to leave El Nido. But there were already many people who were hoping some might cancel. Some people explained they have to take the ferry to Coron on that day so that they can still catch their flights at Coron Airport. 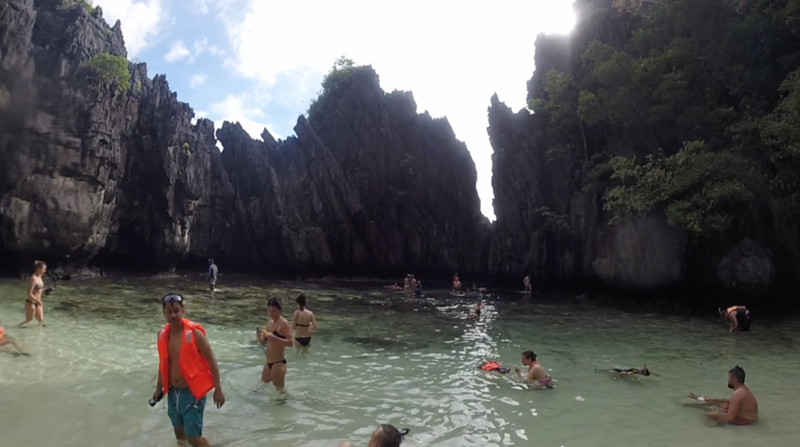 Those were all of the troubles I had in El Nido. It became a pretty negative article but I learned that it is important to think of what to do in case an emergency happens. If you have such consciouness, the action will be different. I would like to write about the tour next.